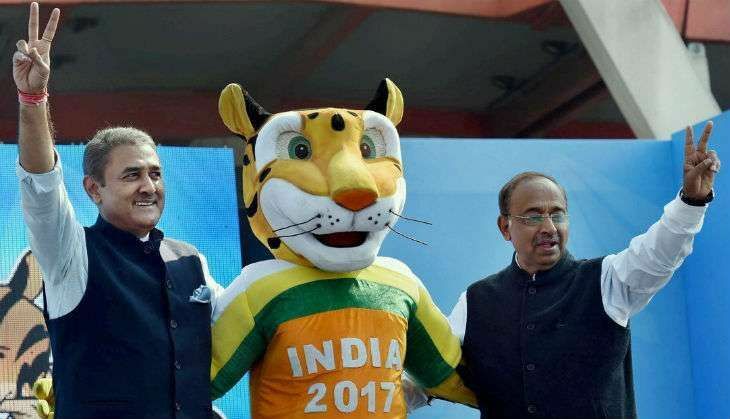 The official mascot for FIFA U-17 World Cup India 2017 was unveiled on 10 February 2017 at New Delhi's Jawaharlal Nehru Stadium. A clouded leopard, called Kheleo, will be the face of the tournament which for the first time is being held in India. The ceremony was attended by India's Minister of Youth Affairs and Sports, Vijay Goel, and the chairman of the Local Organising Committee and AIFF President, Praful Patel. With its habitat ranging from the foothills of the himalayas to mainalnd southeast asia, the clouded leopard is an endangered animal. Praising Kheleo, after it was introduced to hundreds of football fans, Mr Goel said, "We are sure that he will be one of the most memorable mascots a sporting event in India has ever seen. Kheleo is young, vibrant, enthusiastic and a perfect representation of our country. He will help us to involve kids with football in a fun way." "Presenting Kheleo as the Official Mascot to the world is another big step for our event. As the face of the FIFA U-17 World Cup India 2017, he will be going across the country to promote the tournament and to inspire kids and adults alike. ", sais Mr Patel. The tournament will be played from 6 to 28 October 2017 and Kheleo will take part in various activities in the run-up to the tournament.